Young Mayor’s Christmas Party Success! The Downs Leisure Centre was abuzz with the sound of excitable children on Friday 4th December as many local families attended a Children’s Charity Christmas Party hosted by Young Mayor of Seaford Gabrielle Edwards. 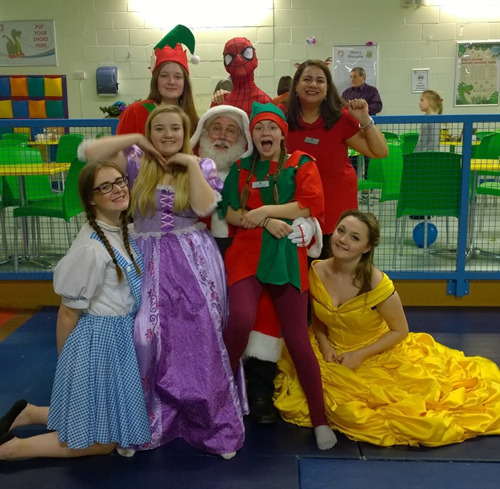 The children greatly enjoyed dancing with fairytale princesses and very helpful elves and taking part in various Christmas themed party games. The event concluded with a visit from Santa Claus, along with his favourite reindeer Rudolph. The party was held to raise money for the Young Mayor’s chosen charity Teddy Treats Children’s Charity. Thanks to everyone that bought tickets and made purchases on the night the team managed to raise over £350! Thanks also go out to all of our sponsors; Seaford Chamber of Commerce, David Argent and Middleton Heating & Plumbing, to Toy Town and Seaford Tourist Information Centre for helping to sell tickets and of course to Dynamite Disco for providing excellent music and entertainment on the night.